Pallas Saunders grew up trying to please her mother. She expected to earn a degree in finance and work in the bank founded by her great-great grandfather because she knew that would please her mother. But when Pallas took a job at Disneyland for the joy of it during her third semester in college, she made C in geology, bringing her GPA below the level required by her mother. Her mother cut off all financial support, and Pallas was forced to find a job. She found work at Weddings in a Box, a business that provides the themed trappings for couples who have chosen Happily, Inc, a famous wedding-destination town in the southern California desert, for their special day. For eight years, Pallas worked at Weddings in a Box while working toward completing her degree. Gerald, the owner, became a mentor and a father figure for Pallas. Upon his death several months ago, Pallas inherited the business. Nick Mitchell, one of the five Mitchell brothers of Fool’s Gold and a renowned artist, followed his brothers, Mathias and Ronan, to Happily, Inc. It seemed a good place to kill a few months while he waits for confirmation that he has been commissioned to create a piece of art for a Dubai hotel, a two-year project. When Nick shows up to interview for a temporary, part-time carpenter job at Weddings in a Box, he finds himself drafted as a Roman soldier in a wedding. Shortly thereafter, he discovers two beautifully carved wooden panels in need of restoration. As an artist whose primary medium is wood, Nick is determined to be the one to restore the panels. Pallas is uncomfortable at the thought of the famous Nick Mitchell working for her at a salary barely above minimum wage, but she yields to Nick’s pleas that he be allowed to preserve the panels. Both Pallas and Nick have a troubled history with a parent. Pallas is caught in a life-long cycle of trying and failing to please her mother in order to earn her love. She even considers her mother’s demand that she sell Wedding in a Box and accept a position at the bank because she has always accepted her mother’ dictum that she was destined to follow in her footsteps. Nick’s father is a gifted glass artist, but he is an egomaniacal, self-indulgent man, an unfaithful husband, and a jealous father who ignores some of his sons and tries to dominate others. Both his father’s egocentric passion for art and his mother’s self-abnegating passion for her husband have made Nick wary of commitment. Neither he nor Pallas is looking for a relationship, but attraction leads to flirtation and flirtation leads to physical and emotional intimacy. Can Nick overcome his fears, or will he break Pallas’s heart and his own? 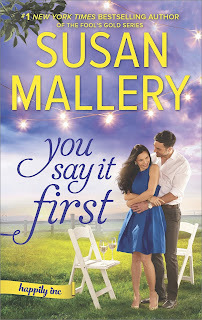 You Say It First introduces Susan Mallery’s Happily, Inc series, and all signs point to a series that should prove as popular as the author’s Fool’s Gold series. It helps, of course, that the Mitchell brothers are already familiar to Mallery’s readers. Not only are Del Mitchell’s story (Thrill Me, 2015) and Aidan Mitchell’s story (Best of My Love, 2016) part of the earlier series, but the revelation of the big family secret concerning the “twins” Mathias and Ronan also occurs in that series. The spin-off factor will delight many readers. But this novel has more going for it than its spin-off status. Pallas and Nick are engaging characters in their own right. Readers will empathize with their struggles toward greater maturity and self-awareness as they conquer the barriers to their HEA. I particularly appreciated the transformation of Weddings in a Box to Weddings Out of the Box and rooted for Pallas’s move out of her own boxed-in life and her declaration of independence from her mother. And I loved Nick as artist hero! A large cast of secondary characters adds to the novel’s appeal. Pallas’s resourceful grandfather, the creator of Happily, Inc, is a special delight. Her colorful “girlfriend squad”—Carol Violet, Natalie, Silver, and Wynn—are a terrific support system for Pallas in her private life and in her business, and they are interesting. Mallery hints at the stories of each of these women. Mathias and Ronan Mitchell, wounded and gifted, are clearly meant to be heroes, and Pallas’s twin brother, Cade, her cousin Drew, and a thriller writer who lives in the area also have potential. If you enjoyed Mallery’s Fool’s Gold books, I think you will fall in love with Happily, Inc. If you are new to Mallery, you will find that she is one of the best in the genre at creating a vibrant community inhabited by likeable, relatable characters. Her Fool’s Gold series ran for six years and included more than twenty novels plus five novellas and a short story. After reading this introductory novel, I won’t be surprised to see Happily, Inc repeat that success. If you share my series addiction, I suggest you grab your copy of You Say It First ASAP. I enjoy Susan Mallery's books. I may not have time to read it until Christmas but this one is going on my tbr. Thanks, Janga! I really enjoyed reading all the Fool's Gold books - I know I'll be reading these Happily Inc books too! Great review Janga! 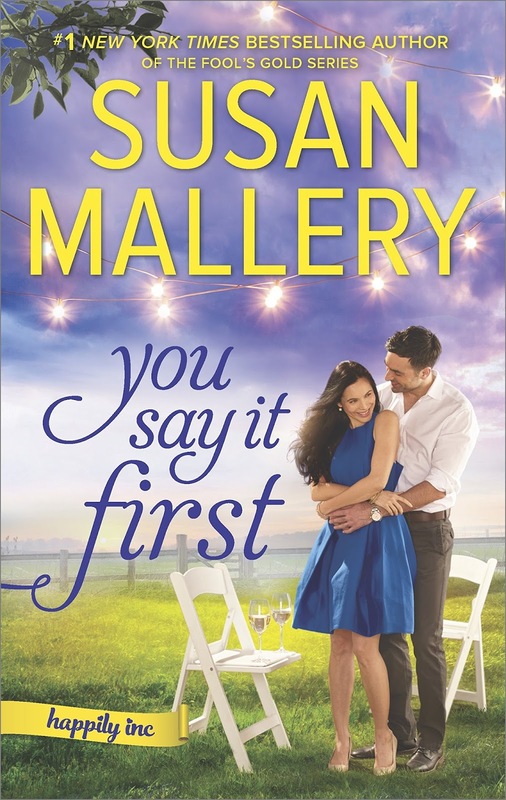 I am looking forward to reading this new series by Susan Mallery. This book is on my need to read list. After a while I grew tired of the Fool's Gold books, but read most of them. I'm looking forward to visiting Happily Inc.